Traditional Death cards are NOT cuddly! 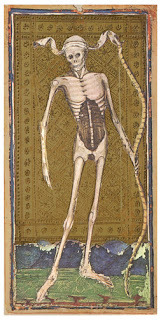 As a tarot reader, you never want to give people negative readings and there are, of course, some cards which seem to have a life of their own in the popular imagination: Death being particularly notorious. And however much, you have a nice little spiel ready about 'change' and physical death being unlikely and often it being a necessary and ultimately positive change, people still tend to blanch when they see that card. This is one of the reasons that most of us don't do those 'does he love me?/ will I get married?' questions. With a yes/no question, there's usually a preferred response - and one that the querent [person having the reading] doesn't want to hear. Asking 'what can I do to bring about...?' or 'why hasn't x happened?' gives the querent possibilities and doesn't render them mere victims of fate, waiting around passively for something to happen to them. It also makes a purely negative response far less likely. I have a few tarot decks that are really nice but I'm not sure how to read them.